Welcome to the final installment of the Blogging the Belinda Quilt series as we walk through tips and inspiration to make this giant hexagon quilt. In previous weeks, we’ve looked at some simple ways to make pieced hexagons, and some ideas to spice it up with some trickier arrangements. In this final blog, we’ll look at how the border might change to accommodate the aesthetic of the pieced hexagons, and some quilting tips. Because the border is so scrappily pieced, you might think there’s no need to change anything up, but as you are going through your scraps to use in the pieced hexagons, you will likely run across fabrics that didn’t make it into the hexagons themselves but deserve a spot in the border. The benefit of that is you can create enough length for the pieced border, you might want to frame the entire center of the quilt with the pieced border rather than just the two sides as outlined in the pattern. Remember to get extra background fabric to accommodate the additional two outer border pieces as required, too. Once you have that top assembled, it’s time to come up with your quilting plan of action. In our original sample for the cover quilt for the Belinda quilt pattern, the hexagons were custom quilted with different motifs. For this particular version of the Belinda quilt, I took advantage of the solid fabrics to quilt hearts in those open spaces, and filled in the rest of the center with a meander design. Once I got to the fill-in border, I used my walking foot to follow the shape of the outside of the hexagon assembly, and then did straight line quilting around the pieced and outer borders. Hopefully you’ve been inspired to give some pieced hexagons (or whole ones as in the original pattern!) a go. 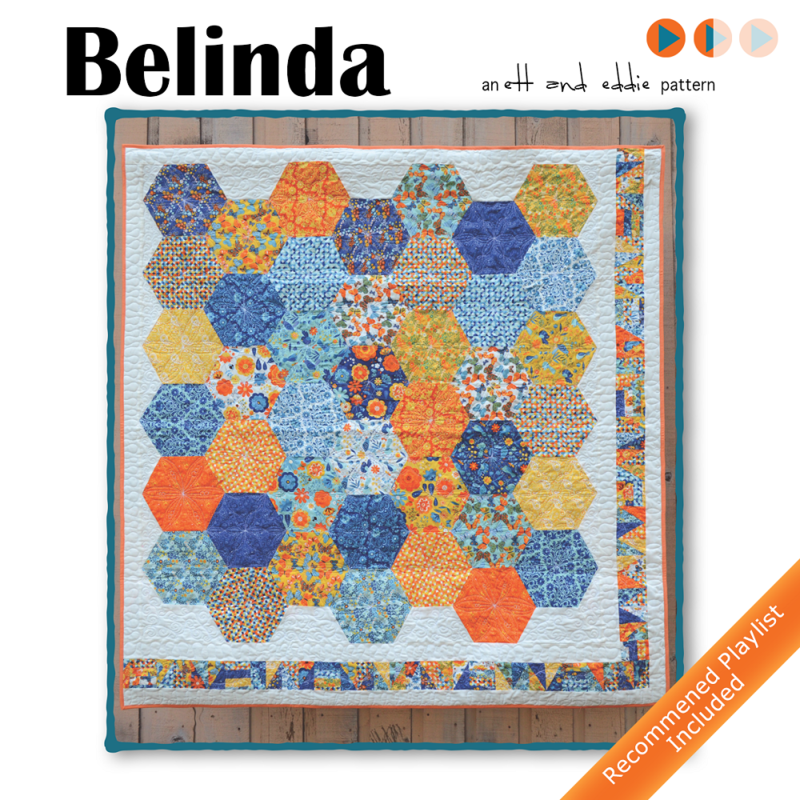 You can get a copy of the digital quilt pattern for the Belinda quilt at our shop!